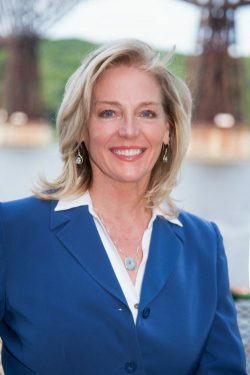 Elizabeth Waldstein-Hart, Executive Director of Walkway Over the Hudson, has been named by The Chamber Foundation, Inc. as one of ten 2018 ATHENA Award honorees. Presented annually, the ATHENA Award recognizes community leaders for their career accomplishments, volunteer involvement, and willingness to serve as a mentor – especially to women in the business community. Waldstein-Hart has served as Walkway Over the Hudson’s Executive Director since 2010. Under her direction, Walkway has raised more than $8 million from competitive grant funding and private sources to support major programmatic and capital initiatives such as the Dutchess Rail Trail connection, construction and opening of the Ulster Welcome Center, and many Walkway Master Plan improvements including benches, lighting, signage, the Washington Street pavilion, and design and construction of both West and East Volunteer Pavilions. Waldstein-Hart initiated the highly successful Walkway Volunteer Ambassador program, formulated a new strategic plan, implemented a new membership program, completed the second Camoin Economic Impact Study, started the annual Starry Starry Night fundraiser, and has led the Greater Walkway Experience marketing and branding initiative. During her tenure, the Walkway’s positive economic and quality of life contributions to the Hudson Valley have led to more than 600,000 visitors experiencing the park each year. ATHENA Award honorees will be recognized at The Culinary Institute of America on Thursday, November 29 from 5-8 p.m. For complete information about the event, visit ChamberFDN.org.